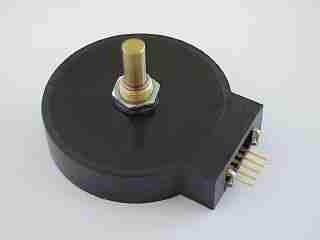 We recommend the ball bearing version if the encoder is driven by a friction wheel. -- Wellendurchmesser: 6.00 mm oder 1/4"
-- Shaft diameter: 6.00 mm or 1/4"
Material: Acetal, Nabe aus Messing, mit Madenschraube, O-Ring aus VITON. Material: Acetal, insert brass, with set screw, VITON ring. Wir haben auch Reduzierhülsen um Reibräder mit 6.35mm Bohrung auf 6mm Achsen zu montieren. We also have bore reducers for mounting wheels with 6.35mm bore on 6mm shafts. Hier sehen Sie ein Beispiel, wie man einen Winkelencoder mit einem Reibrad an eine Montierung (in diesem Fall die alte Vixen ATLUX-Montierung) ankoppeln kann. 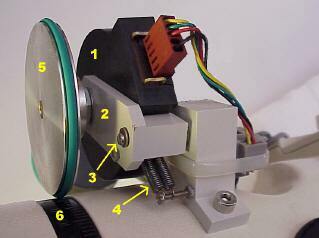 The encoder (1) is mounted on a movable lever (2), which can turn around an axis (3). The lever is preloaded with a spring (4), so that the friction wheel (5) is pressed against the setting circle (6) with a constant force. There is an O-ring on the friction wheel. Please note that we supply only the encoders with cables, but not all the other mechanical parts shown in this picture.